In this talk, I will describe the key secular trends that characterize the field of Big Data with respect to enterprise analytics. I will describe some of the open challenges for enterprise analytics in the context of Big Data. Although some of these problems are not new, their importance is amplified by Big Data. As an example, we will discuss the task of data exploration and leveraging unstructured data for enterprise analytics. Surajit Chaudhuri is a Distinguished Scientist at Microsoft Research and the Managing Director of XCG, a MSR lab that focuses on big bet projects in data platform & analytics, cloud systems, security & crypto, and hardware-software co-design. He also serves on the Senior Leadership Team of the President of Microsoft’s Server and Tools division. His current areas of interest are enterprise data analytics, self-manageability and cloud database services. Working with his colleagues in Microsoft Research, he helped incorporate the Index Tuning Wizard (and subsequently Database Engine Tuning Advisor) and data cleaning technology into Microsoft SQL Server. Recently, he started a project on “Bing-Enabled Data Services” with the goal of leveraging Bing’s unique Data assets for Microsoft’s enterprise products and services. 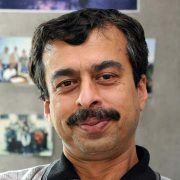 Surajit is an ACM Fellow, a recipient of the ACM SIGMOD Edgar F. Codd Innovations Award, ACM SIGMOD Contributions Award, a VLDB 10 year Best Paper Award, and an IEEE Data Engineering Influential Paper Award. Surajit received his Ph.D. from Stanford University in 1992.